Leopard geckos are inquisitive lizards which are fairly easy to keep and has been captive bred in the US for over 30 years. Leopard geckos are one of the most commonly kept lizards of today because of their adorable colors and patterns. If you are taking home an adorable leopard gecko, then you first need to be prepared about its several needs to live in confinement. One of the most important things you need to prepare for your leopard gecko is lighting and temperature. However, leopard geckos are nocturnal animals. They are more active during the night and might only sleep throughout the day. So, why did I say they need light? Even though leopard geckos do not need lots of light inside its cage, proper lighting plays a crucial role in the health and happiness of leopard geckos. However, you will need to regulate the amount of light which is only beneficial for your pet lizards and does not cause overheating. When it comes to choosing the best lighting for your leopard geckos, there are 3 factors you need to consider. 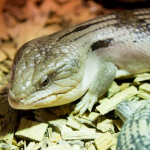 Because these insect-eating lizards came from Afghanistan, Northern India, and Pakistan, they need a particular amount of temperature and heat in order to survive their captivity. 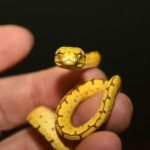 Here are 3 factors that you should consider when buying lighting for your leopard gecko’s cage that will ultimately affect the happiness and health of your leopard gecko. Temperature plays a crucial role in the lighting of your leopard gecko’s cage. Because lighting is also a way to provide heat, you need to regulate the temperature inside the cage wherein it will not be detrimental to your leopard gecko’s health. In case you are using a mat heater, then there is no need to make use of UV bulbs for lighting. Because your leopard gecko is already in a warm environment in order to keep him happy and healthy, there will be no need to add another heat source such as UV lighting. You can make use of a small bulb which projects blue light instead of in order to minimize the heat while providing your leopard gecko with enough light to roam around its habitat during the night. Because leopard geckos are nocturnal species, they rarely bask in the sun. Nighttime darkness, on the other hand, plays a crucial role in regulating your leopard gecko’s internal clocks effectively. If you want to watch the whereabouts of your pet lizard during the night, then using any white light is a big no-no. Instead of white light, you can make use of red or blue light which is color that does not disturb your leopard geckos. Additionally, these types of lights provide extra heat in places with cold temperature. UV lighting is needed for some species of lizard to aid their calcium absorption. 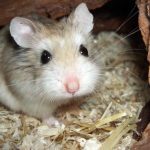 To these animals, lacking UV exposure can cause a condition called metabolic bone disease. Leopard geckos, on the other hand, are not prone to such conditions due to the fact they are nocturnal animals and do not bask in the sun. Therefore, the presence of UV light or direct sunlight will not hurt them. However, you need to provide hideaways in forms of woods and rocks in their enclosure. 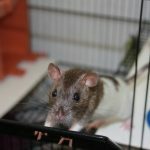 And also, UV lighting can boost temperature inside the cage, which affects the amount of heat lighting that is needed. The Repti Basking Spot Lamp from Zoo Med features a unique patented double reflector which focuses 35% more light and heat into a tight beam. Perfect for your leopard gecko’s basking spot in order to regulate its body temperature. This 75 watts lamp by Zoo Med can be used for 10 to 12 hours a day without a problem and is mostly perfect for diurnal reptiles but also useful for nocturnal lizards. The Zoo Med Basking Combo is a two in one daylight spot lamp and an infrared heat lamp. It includes a 75 watts Reptile Basking Spot lamp during the day and a 75-watt nocturnal infrared heat lamp for the night. This Basking Combo lamp from Zoo Med is the perfect way in order to meet the heating needs of your leopard geckos 24 hours a day. This infrared heat lamp is made out of a true red glass with premium quality in order to offer a 24-hour heat source every reptile including leopard geckos. Infrared bulbs are also an excellent way to view nocturnal reptiles without disturbing them with unnecessary white light. The Reptile Basking Spot Lamp features a double reflector design which emits a light beam in order to create an effective basking site for your reptile to rest and absorb heat. The Exo Terra Night Lamp stimulates natural moonlight and is the perfect bulb for nocturnal viewing without disturbing your pet’s night and day cycle. the heat that is generated by the bulb is minimal; however, it is enough to provide tropical nighttime temperatures. The Night Heat Lamp emits a bluish color because of the blue glass and its lower voltage does not interfere with the natural night drops in temperature. This UVA/UVB Mercury Vapor Bulb from Evergreen Pet supplies is the perfect daylight bulb for a wide variety of amphibians and reptiles like toads, frogs, chameleons, lizards, iguanas, snakes, leopard geckos, turtles, tortoises and bearded dragons. This large bulb is compatible with different sizes of the enclosure and is tested for quality. It is a powerful source for UVB and UVA lights with visible light and heat that is completely self-ballasted meaning it has no harmful UVC outputs. This bulb should be used with a good-quality ceramic socket and a large or deep some that are capable of supporting the large bulb. 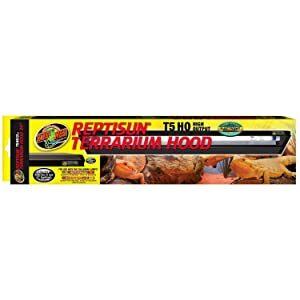 Unlike the regular bulb lighting style, the Zoo Med Reptisun Terrarium Hood is a high output bulb with new horizontal low profile design. It provides the right amount of UVA and UVB light for your leopard gecko’s basking spot. This basking light has high output light fixture with an on and off switch for your convenience. It is energy efficient with T5 HO Electronic Ballast for a rapid start and maximum performance. 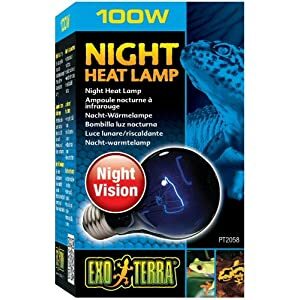 The Exo Terra Heat-Glo Infrared Spot Lamp is a powerful source of infrared heat emission in order to increase the overall temperature of your leopard gecko’s terrarium. 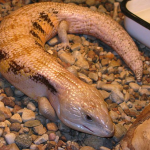 This particular bulb is ideal for nocturnal viewing and its reddish light will never disrupt with the normal activity of your leopard gecko during day and night, making it the perfect 24 hours radiant heat source. The Exo Terra Heat-Glo Infrared Spot Lamp has red glass helps emit infrared heat waves that are produced by the special filament inside the bulb. It has a special built-in reflector to direct heat in any direction necessary. With a true red glass (not coated or painted), the Zoo Med Nocturnal Infrared Incandescent Heat Lamp is the perfect 24-hour heat source for all reptile and amphibians. It provides very little amount of visible light so as not to disturb your pet’s sleeping pattern. Furthermore, this is also a perfect lamp for nocturnal viewing of your leopard gecko. 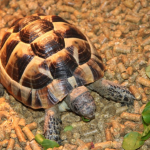 The Zoo Med Nocturnal Infrared Incandescent Heat Lamp has spot reflector which focuses more heat to your reptile and helps minimize nighttime glares. This 75-watt basking spot lamp from Exo Terra features neodymium sleeves which provide the terrarium a more natural appearance. Its standard spectrum is perfect for plant’s photosynthesis and the UVA light contributes to your reptile’s physiological well-being. This spot lamp allows direction of light and heat in a particular direction in order to create the perfect basking site inside the terrarium. 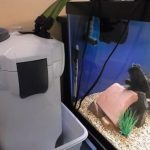 It also helps in increasing the ambient air temperature for your leopard gecko. This Heal Lamp Bulb is a perfect 24 hours heat source for your leopard gecko. The ceramic heat emitter is a radiant heat source that creates a natural sun-like heat in a uniform pattern and can last up to 10,000 hours. 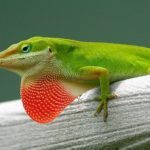 The long wave infrared heat that is produced can arm reptiles very efficiently and also increases the ambient air temperature inside the terrarium. This heat lamp bulb does not disturb the normal sleeping patterns of your reptile pet making it perfect for everyday use. The Exo Terra Daytime Heat Lamp makes a good choice for your leopard geckos basking spot. With a 100-watt broad spectrum, it makes the perfect temperature inside your leopard gecko’s terrarium. This daytime bulb is coated with Neodymium sleeves that help provide your terrarium a naturalistic appearance. It has a spectrum that is perfect for your reptile’s health and plant’s photosynthesis. For every amateur reptile owners, lighting and temperature is probably the biggest obstacle. And because most reptiles need different temperature zones, getting the exact temperature can be tricky. Ask about any leopard gecko owners what the perfect basking spot temperature is and you will hear various answers. The truth is: leopard geckos are okay with really high temperatures in terms of hot spots. They only need the hot spot in order to get their body on temperature. And when they reach the perfect temperature, they will instantly leave that spot. A hot spot temperature of 95 to 100 degree Fahrenheit is definitely okay. 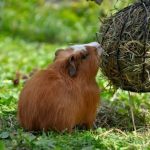 There are some owners who might even have a higher hot spot temperature which is also okay as long as the overall temperature in the cage does not get really high. 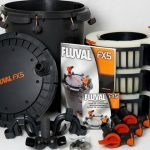 You can select and view other product reviews in here. In order to regulate body temperatures, a leopard gecko also need a cool zone. The temperature in this cool zone needs to be at least 74 to 80 degree Fahrenheit. Also, you will need to add a moist hide in the cool zone for your leopard gecko to be happy. During the night, the most preferred temperatures in your leopard gecko’s cage should be between 70 and 75 degrees Fahrenheit. As you already know, leopard geckos are nocturnal, however, that does not mean that you need to keep your light on all through the night. You need to stimulate a normal day inside the terrarium. The sun goes up and will shine for at least 12 hours a day and then comes the night. So let us say that you switch your terrarium’s lights on at 10 in the morning, and then you will need to switch it off by 10 in the evening. Remember not to switch the lights on and off whenever you want. If you have decided to turn the lights from 10 in the morning until 10 in the evening then you need to stick with that schedule. If not and you turn the light on and off whenever you wish, then it would disturb your leopard gecko’s circadian rhythm that can result in health issues. And I know what you are thinking— manually switching the light on and off at the exact time each day are sometimes impossible and quite annoying. Do you have a leopard gecko with albinism or red eyes? Then you might want to be careful. These leopard geckos have extremely sensitive eyes and a lighting which is too bright can hurt their eyes. 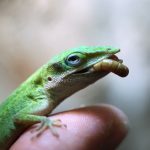 In case your gecko with red eyes is blinking all the time or possibly hiding the whole day, then it is a telltale sign to change your bulb since it is too bright for their eyes to handle.